Ceiling fans are the most neglected appliances when people think about reducing electricity consumption in their house. Most people focus on lighting to fix their high electricity bills, but fans consume a lot more than lights. To give a perspective a regular (non BEE star rated) ceiling fan consumes 75 Watts as compared to a regular (most inefficient) tubelight that consumes 55 Watts. Also a ceiling fan is used during the day as well as night whereas a light is used only during the night. In totality ceiling fans consumes more than twice or thrice the amount of electricity as compare to lights. But most people ignore power consumption of ceiling fans while buying them. BEE or Bureau of Energy Efficiency in India started rating ceiling fans of 1200mm sweep (regular sized ceiling fans) a few years back and since then the manufacturers have started coming out with efficient ceiling fans. To help people make electricity consumption as deciding factor, we at Bijli Bachao have decided to put up a list of Best Ceiling Fans in India by electricity consumption and size. These are some of the leading brands for ceiling fans in India. Among these brands you will find some good energy efficient ceiling fans. 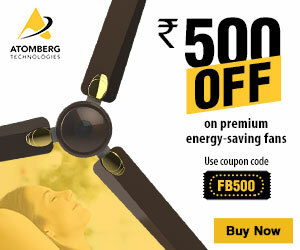 However, BLDC is the latest and most energy efficient technology available in fans and some good brands that offer BLDC fans include: Orient, Superfan and Atomberg. When looking for a ceiling fan the few things that we usually look for is: Good air delivery, silent operation & reliability. We at Bijli Bachao also add energy efficiency to it. When we tried searching for all these things the one model that came up on top was Crompton HS Plus. This fan comes from Crompton, which is an old and reliable company making ceiling fans and many other appliances. The fan is a BEE 5 star rated fan consuming only 53 watts of power at peak speed, has 218 CMM of air delivery (which is quite good) and has silent performance. Even from the price point of view, it is quite decent. On the whole if you are looking for a fan that has good air delivery, silent operation, energy efficient and comes from a “Popular” brand, then Crompton HS Plus is a great buy. Pros: Good air delivery with high energy efficiency. Cons: May feel “slightly” less airy as compared to other high RPM fans (but will be quite comparable to any other normal fan). Key Specs: 1200 mm sweep, 370 RPM, 218 CMM air delivery, 53 watts. BLDC is the new “in thing” in technology as far as ceiling fans are concerned. Traditional fans have induction motors that vary speed based on the input voltage (regulated by a regulator). BLDC is a new electronic technology which has an electronically operated motor. Firstly, it is highly energy efficient (65% less electricity), and on top of it, it gives a lot of options of operating it from remote, phone or even IOT devices in future. The best BLDC fan that is available in market comes from an IIT Bombay startup “Atomberg Technologies”. Called as Gorilla Fan, this fan consumes just 28 watts at peak speed. In fact, it runs at as low as 2-3 watts at lowest speed. The air delivery is 230 CMM which is as high as any high-speed fan in the market. If you have a commercial connection, then the power factor of this fan is also quite high at 0.98. The user feedback of this fan on e-commerce platform is just fantastic. The company which started in 2012 is now producing 25000 ceiling fans per month and has made great strides. They have also developed a good dealer/distributor network across the country. If you want something super money saving, futuristic and all this without compromising on the basic value that one gets from a fan: good air, reliability and silent operation. Then this is the best fan for you. The bonus is that it runs super long on power inverters or solar inverters. Pros: Highly energy efficient without compromising on air delivery, reliability and noise. It may sound expensive but then it has great return on investment. Operation from remote is luxurious. No hassles of regulators breaking down regularly (as it does not need regulator). Cons: Very few designer and decorative options. BLDC is a new tech, so not every electrician may be able to repair your fan. Smaller network as compared to established brands like Crompton, Havells, Orient, etc. Key Specs: 1200 mm sweep, 380 RPM, 230 CMM air delivery, 28 watts. BLDC fans is a trend that most popular brands were late to catch on. But among all, Orient was the first one to come out with a BLDC Fan. And when it came out, it was quite expensive. Since then Orient has significantly improved on it and even the price has reduced drastically. This fan consumes just 35 watts at peak running spead. It has all the benefits that any BLDC fan has: low power consumption, ease of use with remote control, silent operation (even on inverter) & long running hours on inverters. The air delivery is also good at 220 CMM. If you are someone who wants to go for BLDC technology but want it from a popular brand, then Orient Ecotech Plus is a good buy. Pros: High energy efficiency (low power consumption), silent operation, ease of use with remote control, long running hours on inverter. Cons: The air delivery could have been better as other BLDC fans in market are giving better at lesser electricity consumption. Even ecotech lacks designer options. Key Specs: 1200 mm sweep, 220 CMM air delivery, 35 watts. If you are someone who is not keen on buying an energy efficient fan and are looking for a reliable regular ceiling fan with good air delivery and silent operation, then Havells Pacer is a good ceiling fan for you. Havells is a trusted brand for ceiling fans and other electrical appliances for many years now. They have a good distributor network and service network throughout the country. Their quality is also quite reliable. This particular fan is a 1200 mm sweep fan (regular sized) which consumes 75 watts of power and gives 230 CMM air delivery and runs at 400 RPM at peak speed. The air delivery is among the highest that you can get in the market. The general feedback about this fan is also quite positive and if BEE 5 star rated fans are not to your liking, then this fan can be a great value for you. Pros: High air delivery, high RPM fan. Not as expensive as BLDC fans or energy efficient fans. Cons: Lacks designer variants. High power consumption. Key Specs: 1200 mm sweep, 230 CMM air delivery, 400 RPM, 75 watts. If you are in market looking for a decorative fan which is not too expensive, then Crompton Aura will certainly be of great value to you. It has several variants with contemporary design to complement any modern décor. It has models with metallic finish which looks just great. The air delivery of this fan is also quite high and the power consumption reasonable. A 1200 mm sweep fan, this fan has air delivery of 230 CMM at power consumption of 74 watts. So, if you want a decorative fan for your room, then this comes across as a great choice. Pros: High air delivery, high RPM fan. 13 different variants with different metallic designs. Also has Anti Dust variant. Cons: High power consumption. No remote control. Key Specs: 1200 mm sweep, 230 CMM air delivery, 380 RPM, 74 watts. Please note that the list below is based purely on electricity saving potential data from Bureau of Energy Efficiency and it does not include brand value of the model (as brand value is more subjective than objective). We would recommend that you go for a model that is from a brand that is known to you. The basis of this ranking is the data from BEE (Bureau of Energy Efficiency). BEE data contains power consumption and air delivery of a Ceiling Fan and this information is self reported by the manufacturers. The data is calculated in test conditions. We have used Service Value or (air delivery/power consumption) for giving ranking to various models of ceiling fans. The Ceiling Fan with the maximum value of Service Value is given the highest ranking. The list currently only contains data for 1200 mm sweep fans as this information is available to us via BEE. We will update the list once we get data of all other size fans as well. We regularly update this list as new models get added in the BEE list of Ceiling Fans. The list below has Air Delivery mentioned in CMM (Cubic Meter Per Minute) and Power Consumption mentioned in Watts.